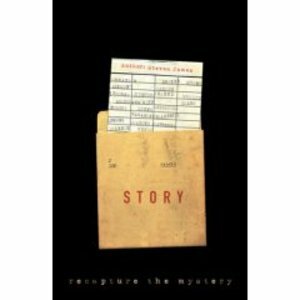 I randomly picked up Story by Steven James in Barnes and Nobel yesterday. I had never heard of him or his book until yesterday but it didn't take long for me to become intrigured by it. It's a beautifully creative blend of storytelling and poetry to bring us, emotionally and intellectually, face to face with the story of Scriptures. "Because the empty tomb doesn't make sense without the cross, the cross doesn't make sense without the manger in Bethlehem, and the manger doen't make sense without the Garden of eden. It's all one story. And only when you finally untangle it, see its scope and enter it for yourself do you realize that the story has finally entered and at last untangled you." "The sweep of the heavens glistens above me. gathered from eternity and handed to me here. a new day is awakenning in my soul." Sounds interesting. I will have to take a look. this looks like a great book, i'll have to give it a read. I was just sitting, thinking last night about how it is difficult for me to get my head around the idea of God as a poet, a painter. I see him more as the great, busy fix-er of all things. Thanks for sharing! Wow, this is so beautiful. I am going to have to read this bok. Thanks for bringing it to my attention.